So… I had another one of those “hrrm… this shouldn’t be hard to hack a proof-of-concept” moments. Web apps are increasingly speaking JSON all around the place. Why can’t we speak JSON to/from the database? Why? Seriously, why not? One reason why MongoDB has found users is that JSON is very familiar to people. It has gained popularity in spite of having pure disregard for the integrity and safety of your data. But that wasn’t nearly enough… I also wanted to be able to issue arbitrary queries. Thanks to the supporting code we have in the Drizzle server for EXECUTE() (also used by the replication slave), this was also pretty easy. I created a way to execute the content of a HTTP POST request as if you had done so with EXECUTE() – all nicely wrapped in a transaction. Welcome to the Drizzle client..  Commands end with ; or \g. So what does this get us? With the addition of proper authentication, you could start doing some really quite neat and nifty things. I imagine we could add interfaces to avoid SQL and directly do key lookups, table scans and index range scans, giving really quite sweet performance. We could start building web tools to manage and manipulate the database speaking the native language of the web. 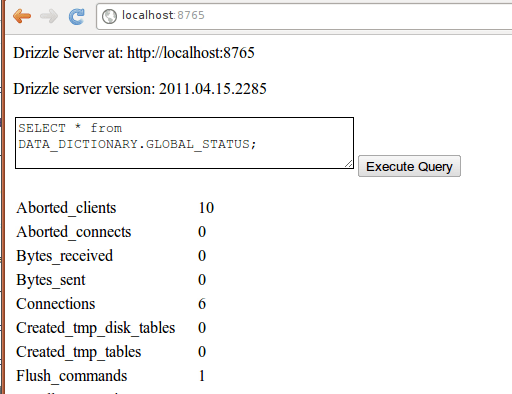 Since we have a web server and a way to execute queries via HTTP along with getting the result set as JSON, why can’t we have a simple Web UI for monitoring the database server and running queries built into the database server? This entry was posted in drizzle by Stewart Smith. Bookmark the permalink. this is a nice hack, but just like dbslayer, it doesn’t really solve much IMO. Or I should say, this solution has a very limited scope. The main problem is that the input is still SQL, and that the output is still just a rowset. SQL is a problem because it’s too powerful in many ways, tabular resultsets are a problem because you need multiple requests and non-trivial postprocessing at the client side to build meaningful objects from them. Putting the components that allow HTTP access and encode results as JSON inside the database doesn’t really change that. 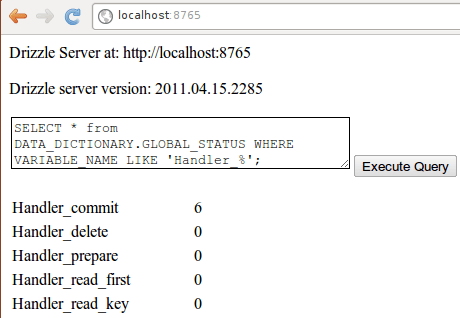 For the server this means much less HTTP requests since the clients can get to all related data with a single request. Since the query language is JSON, it is much easier to parse and to secure than SQL and read/write splitting is also much easier than with SQL. Sure, HTTP/JSON is half of it. Objects/documents are the second aspect. If it needs to be MQL like and if SQL is wrong, not sure. Yes :) And I dare say, it’s that half that was never a problem to begin with, as it is trivial to solve outside the database in any (or maybe alsmost any) webstack. And this is that half that is essential to make this a serious solution IMO. Of course SQL is not “wrong” :-) SQL is a fine language, I think it’s great in a classic client/server environment, and as way for middleware to communicate with the database, and many other purposes too. But OLTP data access from a modern web client is not one of them. One problem is that SQL is way too powerful. Even with restrictive grants to exclude DDL access, users can still write unreasonable joins or cartesian products and bring the server down. SQL is hard to parse (or at least hard to do that fast) too, so it’s almost no option to filter for harmful SQL at the server side either. And the other side of the coin is that SQL is hard to generate – at least much harder than necessary. In another way, SQL is not powerful enough as it does not provide any reasonable way get sub-1NF results, which is what you need to easily instantiate objects from the result. Settling for tabular results and re-constructing the object structure from there is just going to lead to more requests to fetch the related sets, and to unreasonable burden on the client side to merge the related resultsets. And even if SQL could do that, there is no way to write one efficient query that retrieves one master with two or more details. This is all just a reflection of the fact that SQL’s basic data model is relational – it knows tables, and not much else. Finally, SQL is declarative, but not enough. For example, despite NATURAL JOIN and the USING syntax, in practice writing joins still involves explicitly specifying the join conditions. This is too easy to get wrong, at least for a typical web developer. As far as I can see, MQL solves all these problems. Of course MQL is not perfect – for example it is not suitable for queries of analytic nature. But for OLTP, and especially for Ajax applications, I don’t see a single aspect that doesn’t make it superior to SQL (Except of course that RDBMS-es speak SQL, and not MQL – yet). The only reason why I plugged in SQL first was that we had easy APIs to do it…. MQL and indeed simple key and index operations are certainly something that I think should be looked into. Stewart – thanks. I wasn’t as much trying to criticize this proof of concept as trying to put MQL on the agenda. Sorry for hijacking. you are spreading ideas. Its the best you can do to any reader. Please continue! This is really cool. For me – unlike Roland – this comes pretty close to what I wanted to play with. I already have ideas how to abuse it. …after Easter holiday. …why is there an empty line in the result set? If you are using the Execute API, the empty lines are signaling end of data, IIRC. It might also be interesting to explore CouchDB’s query model and see what it would take to implement something like that in Drizzle. As far as I understand this is not really a query model; to me that feels more like stored routines, and at a pretty low-level at that. In a document database like couchdb I can imagine you simply need the power of an imperative programming language to do all the slightly-more-than-basic data manipulation. But for an RDMBS, it seems like a step back as compared to a declarative query languuage. The current technique employed here simply uses JSON as a message format for SQL. IMO, it doesn’t simplify much for the user. Anyways, that point has already been discussed above. So my suggestion is that, probably something like a CouchDB’s views can be used as a means to map JSON query to JSON result. 1. Invoke a JS stored procedure that gets the query JSON as the argument. 2. Do some processing on it. 3. Return the response JSON. I am guessing a JS wrapper over the existing SQL API should do for the second step. I could be in a totally wrong direction though. Let me know what you guys think :). > more like stored routines, and at a pretty low-level at that. Right, stored routines is more apt. – how would the engine know what tables to hit to find those objects? The couchdb way would to simply scan all documents – this seems an awfully expansive method, especially if we know the underlying data store is relational like in drizzle. I did a deal of thinking about what would be a suitable query language that would fit with JSON-based resultsets. I do not claim that my thinking was exhaustive or that my conclusion is the right one. But it led me to freebase and the MQL query language they use there. I looked at it, and found that all these problems, like how to control what data is to be returned, how to encode complex predicates, how deal with related data, as well as a few more things, like what should write-queries and aggregate queries look like have in fact all been solved in MQL. So my conclusion was that it’d be better to draw on that existing syntax and adapt the semantics to the RDBMS world rather than inventing a new grammar and semantics from scratch. The former is probably slightly easier for a JS developer or maybe other languages too, if the use case is that you already have a JSON document/object/array with the values to search for set, you can just pass the object itself and get it back, rather than building a URL out of it. The latter has the advantage of being more general, I could just pass it around as a URL, no need to attach JSON/JS code to it to make it a complete query. the problem with a REST interface like this is that it locks you in to requests that span just one table. For many applications that query a reasonably normalized RDBMS, the result will be a storm of chatty requests for the server side, and a lot of synchronizing and result merging for the client. Despite it’s popularity and perhaps contrary to popular notion, I have arrived at the conclusion that oldskool RPC is a much better fit for an actual query language. Yes. With a pure url approach you’d have to create views or similar functionality to query something else than a single table. Perhaps that is the reason it is going out of fashion and replaced by MongoDB and others that pass JSON for the query too. It does get points for simplicity though. A query-by-example approach such as suggested by Anurag (and realized by MQL), where both query and result are JSON objects that represent only themselves is even simpler, because the application can take an existing object from the runtime, augment it with those properties that it wants to query and then push that object back directly to the server as the new query. The runtime object needs to be converted to JSON first of course, but you practically get that for free in all modern browsers. You at least do not need to write or include code that walks properties to separately map and escape them to URL parameters. An all JSON query format also enables you to query for multiple objects in a straightforward way (just pass a JSON array of queries).